Daily tooth brushing and peaceful parenting: can they coexist? “It is my responsibility to make sure that my son cleans his teeth every day,” I used to believe this very firmly. So do many parents I know. It seems like a reasonable belief until you have a child (or two!) that refuses to brush their teeth despite repeated requests. No amount of explanation as to why this is an important thing to do would change his mind. In these circumstances this belief can generate a lot of conflict, anxiety and stress – and it did. I know that I could have held tight to my belief in daily tooth brushing but I was very, very tired of all the conflict and worry. I did not just give up on the issue or decide that it was all too hard. Neither did I did I give in to my child and then wallow in resentment and blame. Instead, I wanted an effective solution to an issue that had become a chronic problem in my relationship with my children. In order to find that solution I was willing to examine and question every aspect of this issue. In my experience, pulling something apart can be a powerful step in finding a way to move forward. What does responsibility really mean? I started with looking at the whole concept of parental responsibility. Beliefs about responsibility loomed large in my thinking about parenthood, as they do for most parents. Sure, we have a legal responsibility to ensure that our children are not at risk of significant harm. We must be willing to arrange necessary medical care. But my beliefs were much broader than any legal responsibilities. I am talking about my own piece of the general community vibe. My beliefs about responsibility penetrated into every aspect of my role as a parent. It felt as if this responsibility to ensure tooth brushing was a non-negotiable part of a contract that I had somehow unwittingly signed as soon as my first child was born. It weighed heavily on me. The concept of parental responsibility seems inseparable from the idea that parents should control their children. And yet, this was at the heart of my problem. The measures that I would have to take to get control over my child’s teeth brushing were unacceptable to me. How am I supposed to control my child? I could introduce some sort of reward system. I could bribe. I know that these approaches can result in short-term control. I also know that they undermine a child’s intrinsic motivation to care for their own body. Paying my children to clean their teeth in praise, money or some other “treat” did not seem like a desirable or sustainable option to me. In any event, my child could still refuse or demand an unacceptable price and then I would be back at square one. I could also resort to punishment or the use of physical force. I could use the fear of rejection or disapproval to manipulate my child into doing what I wanted. I could threaten and yell a lot. None of these options appealed to me either. They are all stressful and painful for both me and my child. They also go against my commitment to having a peaceful and respectful relationship with my children. Instead of sticking with any of the traditional methods of parental control of children I wanted to investigate other possibilities. As part of this process I chose to question my belief that my children’s teeth cleaning was my responsibility. I knew that questioning what I believed about my role as a parent might help to open up space for a solution to appear. I was willing to open my mind and to see what I could discover. I used the four questions taught by Byron Katie as a method of self-inquiry. This is a meditative process for discovering one’s own inner truth. At first glance it certainly feels like it is! 2. Can I absolutely know that this is true? No. I can’t. Where did this belief spring from anyway? I feel a great deal of stress and worry. As bedtime comes around I feel tense. I think that I somehow have to make them clean their teeth. I feel compelled to nag, pressure and coerce my children into brushing their teeth. I feel trapped in a conflict I hate. If they refuse I judge them as disobedient and stubborn. If I don’t succeed in getting them to brush every night I feel terrible. I judge myself as not being a good enough parent. I blame my children for making me feel this inadequate. I feel relaxed and open. I feel close to and comfortable with my children. I feel more open-minded about tooth brushing. I am willing to look for ways to support them and care for their teeth that do not cause all that stress and conflict between us. This step involves finding the opposite of a statement (reversing it) and then asking myself whether this “turnaround” is at least as true or more true than the original statement. The concept of responsibility does not add anything positive or helpful to this situation – it just makes things difficult and unpleasant for me and for my children. If the concept relies on me having control over my children’s lives then it is not one that I want to keep believing in. I care for my children. I don’t need this concept of responsibility weighing me down and boxing me into behaviour that I don’t like.. I did not sign a contract of employment. I will abide by the law. As far as I know it does not require me to force my children to brush their teeth every night. I don’t even know why I think that daily brushing is so essential. Where did this “rule” come from anyway? So many of the health guidelines that I once followed are being reviewed and rewritten. Do I really want to jeopardize the quality of my relationship with my child for this one? 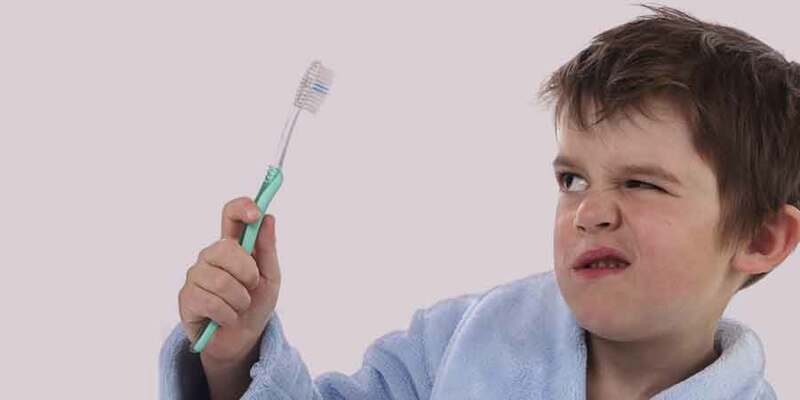 I want my children to be the one’s that have control over whether they brush their teeth every night. It’s their teeth. I want to respect their desire for autonomy over their own bodies. When I asked these four questions I got to see how much stress this belief was bringing into my life. I also got to see clearly why it wasn’t really true for me. My attachment to this belief was broken. Questioning this belief did not change the fact that I still wanted my children to brush their teeth. What it did was to take the emotional charge and stress out of the issue for me. I felt much more relaxed and open-minded and was willing to consider all manner of possible solutions. I actively searched for new information about dental hygiene and tooth decay. My research turned up some surprising results. I now understand that brushing is not as essential as I once thought. According to dental researcher Weston Price and those that have implemented his findings, nutrition may be much more important. This new information widened the field of possible solutions to our problem. I shared the best information I had about dental hygiene and tooth decay with my children. I let them know that there were different opinions and theories about the causes of tooth decay and that I did not know for sure which ones to believe. I told them my own opinion. I was clear that I didn’t want them to experience the pain of tooth ache or trips to the dentist. I didn’t want the expense either. I recommended that they eat tooth-strengthening foods, limit their intake of sugar and also brush their teeth at least one a day. I waited for solutions to appear that we could all be happy with. My child agrees to brush his teeth most nights but likes to know that he can have an occasional night off if he wants without a fuss being made by a parent. My child agrees to let me brush his teeth if he gets to choose the brush and the toothpaste (or go without toothpaste). My child is not willing to brush his teeth daily but is willing to strengthen his teeth by taking supplements and changing his diet. We make a game of brushing and make it a part of a lighthearted and playful bedtime routine that changes and evolves over time. My child is happy to brush most nights. My child takes a holiday from teeth brushing and is then willing to resume regular brushing when gently reminded by me. My child gets a cavity and a tooth ache and is persuaded by a dentist that daily brushing would help prevent such pain occurring in the future. They start brushing most nights. I am happy to say that that teeth brushing is no longer a cause of any stress or conflict in our family. After a long process of experimenting, learning and questioning I can say that daily tooth brushing and peaceful parenting can (mostly) coexist. thanks for this interesting perspective! Pleasure, Kate. Glad you found it interesting.